Here’s another bit of analog synth pr0n for you: Initially sold in 1972, the EMS Synthi AKS was a portable modular analog synthesizer with a built in keyboard and sequencer. 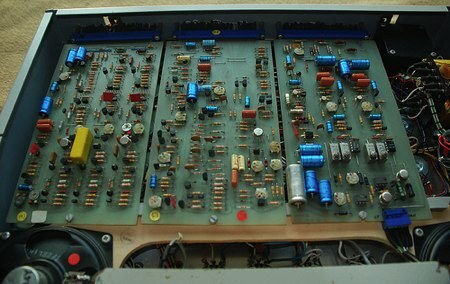 The VCS 3 portion of the device had a unique routing matrix pegboard used to connect components together. [firegroove] has opened up his precious machine so that you can see all of the fine little bits that make it tick… and chirp. Wow – I got to play with the EMS Synthi A while I was attending school at American University. It was one of the most fun synths I’ve ever laid my hands on.